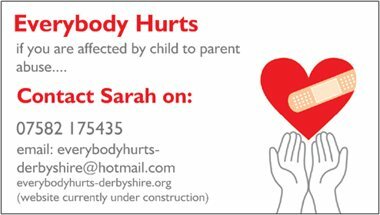 The top story on the Radio Sheffield breakfast programme yesterday morning (October 3rd) was to do with the launch of a support group for parents being abused by their children in the Sheffield area. Toby Foster gave a very sympathetic hearing to “Anne”, who established the group to reach out to parents in the same position as herself. She has a son, now 14, who has been violent towards first his sister and then herself and others since he was 7 years old. He now has a diagnosis of Aspergers, but Anne stressed that violence to parents was not only perpetrated by young people with health issues. Anne started working on the idea for a support group last April when she realised that she was not the only person in her situation. She described being so low that she contemplated suicide, but also some signs of hope as her son has started to show small improvements. Although he continues to do significant damage to the house, he has not hit her or her daughter now for some time. The programme is available to listen to for the next few days here. Toby Foster introduces the story at around 7 minutes in, with an interview with Anne and also with Amanda Holt, author of Adolescent to Parent Abuse: Current Understandings in Research, Policy and Practice. The main interview is just after 8am. Both Anne and Amanda responded to the criticisms that parents should be able to control a child as young as seven, and that all children have tantrums from time to time; making it clear that this was a more serious problem concerned with patterns of extreme behaviour, and that to blame the parent, particularly when the child may be significantly taller than them, was not a helpful response. Details of the support group, Everybody Hurts, were made available to parents calling the radio station. Anne spoke eloquently about her personal situation and is to be commended for her bravery in speaking out. She reminded us too of the importance of supporting parents now. Without help, children’s violence can be seen to escalate as they get older, and these seven year olds may well go on to abuse partners and children in future relationships, if they are not helped to find a different way to express their hurt, frustration and anger. It was very encouraging to hear this subject aired in such a supportive manner to a wide audience. There is a significant interest from the media in the topic of child to parent violence at the moment, and so hopefully this will be the first of many such interviews and features. Thank-you for putting details of the interview on the blog, Helen! I hope my story can make a difference to others in this situation, or indeed working with others in this situation. And thank-you, as ever, for your support and motivation with this subject. Best wishes from “Anne”, aka Sarah from Everybody Hurts.